Crash Dive: A trampoline skill where Â¾ of a front somersault is performed landing in the back.Â Also called a suicide, but that term is not too popular with gym owners. Cody: Back somersault from a front drop on the stomach done on the trampoline.Â This can be a difficult skill to rotate when first learning it. Â It is a good training drill for Tzukahara vaults. Ball Out: On trampoline this term refers to a front somersault done from a bounce on the back. Copyright © 2019 Gymnastics Zone, Inc. All Rights Reserved. 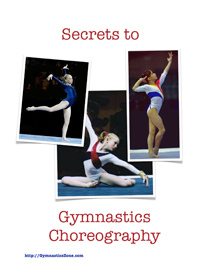 How To Get The Most Out Of Every Gymnastics Practice? Then subscribe and get our free special report! Every gymnast... from beginner to high level competitor will benefit from this special report. This 16 page special report (only available to subscribers of our mailing list) gives tips from over 30 years of gymnastics coaching on how to make the most of your practice sessions. You will learn what you need to do before, during, and after each practice including physical and mental preparation and the key things to do after practice to get the most from the training you've just completed. Also included is an extensive printable checklist of everything to bring with you to your practice sessions.